Surgical scopes are among the oldest forms of medical instrument, with some of the earliest examples on record dating back to 70AD. Initially consisting of simple hollow tubes, over time these rudimentary devices were adapted to include magnifying lenses and illumination, eventually evolving into the sophisticated surgical scopes used today. A series of scopes are seen lined up on an advanced laparoscopic surgical tray. The scopes themselves are of different diameter with different tips at the ends. 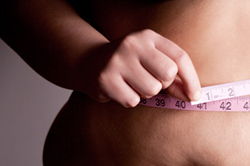 Angled tips are sometimes optimal for looking around corners or at the undersurface of the abdominal wall. Larger scopes allow more light and therefore better image quality and visualization. The first illuminated scope, dubbed the Lichtleiter and consisting of a viewing tube, candle and series of mirrors, was developed by Philip Bozzini of Austria in 1805. Although the device did not find favour amongst the surgeons of the day due to its impracticality, it did serve as a source of inspiration to other inventors, and the following years saw the production of a number of new designs incorporating various types of lamp. The first scope to be illuminated using an electric light source was developed in 1867 by Julius Bruck, a dentist from Breslau. Utilising the principles of incandescent lighting, Bruck’s design employed a platinum wire loop heated with electricity until it glowed. In common with previous forms of illuminated scope, one of the main drawbacks to the design was the amount of heat generated by the light source, which could be conducted along the metal tubing of the scope to the tip, where it presented a significant risk of burns to both surgeon and patient. There are a variety of different scopes that require a video camera in order to transmit the picture to the monitor. These scopes are in reality just a series of lens systems that help focus and concentrate light down the long tube. Like a modern digital SLR camera, image quality is dependent not only on the chip of various megapixels and design but also the glass optical lens system. It wasn’t until the 1950’s, when fiber-optic illumination became a viable solution, that this problem was eventually solved. The use of optical fibres as a transmission medium meant that the illumination source could be housed well away from the scope itself, leading to a significant reduction in the amount of heat transmitted to the tip. The first known fiber-optic scope was developed in the 1930’s but was unsuccessful due to the poor quality of optical fibre available at the time. Various inventors contributed to work on improving the transmission capabilities of optical fibre, including Dutchman Abram Van Heel, British physicist Harold Hopkins and American Brian O'Brien. Initially used to transmit light, tightly packed bundles of optical fibres were eventually used to transmit images, enabling the development of flexible endoscopes, with O’Brien obtaining a patent for a fiber-optic endoscope in 1954. Another significant leap forward in scope design occurred in the 1950’s when, after observing the continued need for an improved form of rigid scope during his work on optical-fibres, Harold Hopkins introduced his ground-breaking rod lens design. Previously, scopes had consisted of a series of lenses, separated by air gaps, housed within a metal tube. In order to maintain a usefully small scope diameter, the lenses themselves needed to be very small, but such tiny lenses were extremely difficult to manufacture at the time, hence tended to be of poor quality, leading to images lacking in clarity and brightness. Hopkins’ design made use of glass rods in place of air gaps, removing the need for lenses altogether. The clarity and brightness of the resulting images was up to eighty times greater than was offered by comparable devices at the time. Additionally, the rod lens system enabled smaller diameters of scope to be manufactured, allowing for transmission of light via an outer ring, and paving the way for modern minimally invasive surgical techniques. Analog medical cameras have been available since the mid-1970s, but were initially very heavy and could not be disinfected, limiting their usefulness in surgical applications. A major breakthrough occurred in 1982, when the first solid-state medical camera was introduced. Based around a silicon chip called a charge-coupled device (CCD), these digital cameras were lightweight, sterilisable, and offered improved color stability. CCDs are now commonly found in many consumer products including digital cameras and webcams. They consist of a silicon chip covered in image sensors, known as pixels, which convert incoming light energy from a visual scene into a digital signal that can be stored, processed or transmitted with greater efficiency and reliability than its analog equivalent. Today, a typical laparoscopy system consists of four main components: One or more digital cameras, a light source, a monitor and the scope itself. Stereopsis, or the ability to differentiate depth of field, requires two eyes looking at the same image with a little difference between the two. Ocular disparity is the difference between the position between the left and the right eye in the human. The robotic system uses two cameras and two different lens systems working almost in parallel but with a slight difference. The 3D vision of the robot is produced in a very similar way as with the human mind. Cameras can employ different lens types, including zoom or interchangeable fixed focus, and can be single or triple chip design. Single chip cameras contain sensors for red, green and blue light embedded on a single CCD chip. Triple chip designs utilise a prism located in the camera head unit to split the incoming image into red, green and blue components, and direct those beams of light into three separate CCD chips. The resulting image can offer superior quality in terms of colour definition and clarity, but triple chip cameras are more expensive and heavier than single chip versions. Weight is a significant factor as the camera is typically mounted directly on top of the scope, and a heavier camera can make the instrument more difficult to manoeuvre. Once the image has been digitised, it may undergo additional processing, with some systems offering features such as filtering, noise reduction, colour adjustment and image enhancement. The resulting video feed is then sent to a monitor, where it can be viewed by the surgeon and the rest of the surgical team. High definition flat-panel monitors are now commonly used, some of which include sterile touch-screen functionality, offering the surgeon control over the entire imaging system via the monitor. Images can also be routed to an eyepiece or head mount display. The latter option is employed by 3D systems that use a pair of cameras to capture a stereoscopic image. Additionally, the video output can also be recorded, or even viewed remotely via a live internet feed opening up a range of opportunities in terms of remote and collaborative working. Illumination is typically supplied by an incandescent bulb, with an output in the range of 250W to 300W. As in Bruck’s time, such bulbs generate a significant amount of heat in the form of infra-red (IR) light. A heat filter to reduce the amount of IR transmitted to the laparoscope is therefore required. Most systems also include circuits to allow the surgeon manual adjustment of light levels, in order to account for factors including personal preference and differing ambient lighting conditions. Automatic adjustment systems are also available. These make use of the luminance signal derived from the video output to work out if the image is overexposed and adjust the intensity of the light source accordingly. 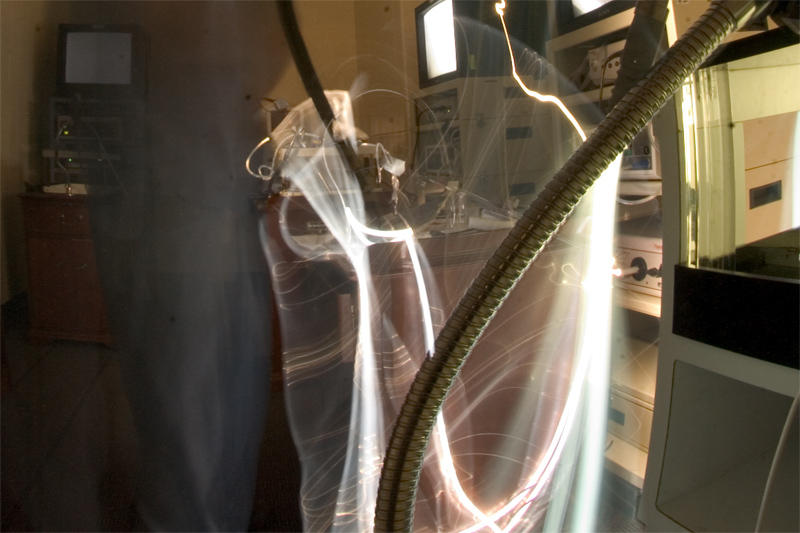 A photograph created with a long shutter captures light degradation in the light cables of old laparoscopic systems now relegated to the lab. When the image quality is not optimal during a laparoscopic case, there can be many sources to the problem. The problem can be in the scope (or the lens system), the camera (the recording device), the monitor (the device that displays the information), or the light cable that is providing the amount of light needed to illuminate the entire abdomen through a very small opening. A condensing lens is used to concentrate light from the bulb down into a narrow beam at the cable input, where it is transmitted to the laparoscope via a gel or fibre cable. Gel cables consist of a metal sheath filled with liquid crystal gel, terminated at each end with a quartz crystal. Fiber-optic cables are formed from tightly packed bundles of optical fibre, surrounded by several layers of protective flexible sheathing. Both types of cable offer very high levels of light transmission but are somewhat fragile, and whilst gel cables can provide superior results in terms of brightness and color temperature, they are also more prone to breakage due to the rigidity of the outer metal sheath. The laparoscope itself typically consists of an outer ring of optical fibres used to transmit light into the body, and an inner core of rod lenses via which the illuminated visual scene is relayed back to the camera. Various different types of laparoscope are available, specified in terms of overall length, number of rods, diameter and angle of view. Generally speaking, the wider the scope, the brighter the resulting image. Lenses are available in the range 1.9mm to 12mm, but sizes of 5mm and 10mm are the most common choices for pediatric and adult patients respectively. Viewing angles of between 0o and 70o are possible, with 0o and 30o being the most commonly used. The 0o scope employs a vertical lens at the opposite end of the scope to the camera, offering a straight-on panoramic view. The camera is attached in a fixed position such that rotation of the scope causes rotation of the camera. 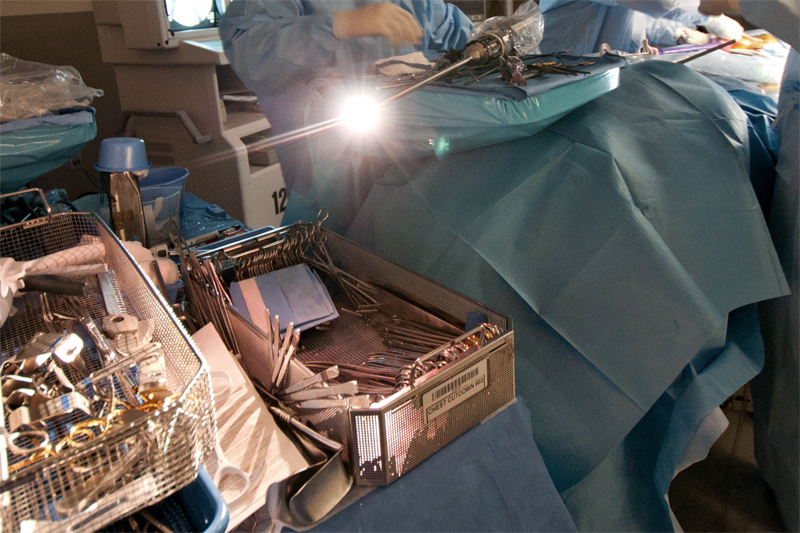 The 30o scope employs an angled lens, which results in an image that is narrower and less bright, but can be used to view around corners, and can allow more space for manipulation of other instruments during surgery. The camera is attached via a rotating coupler, allowing the scope to be turned independently during use. This requires the camera to be held in the correct orientation throughout a procedure. Angled lenses can also become dirty more quickly due to increased contact with the intra-abdominal organs. During surgery, the scope lens can frequently become obscured by fog, blood, saline or other materials. 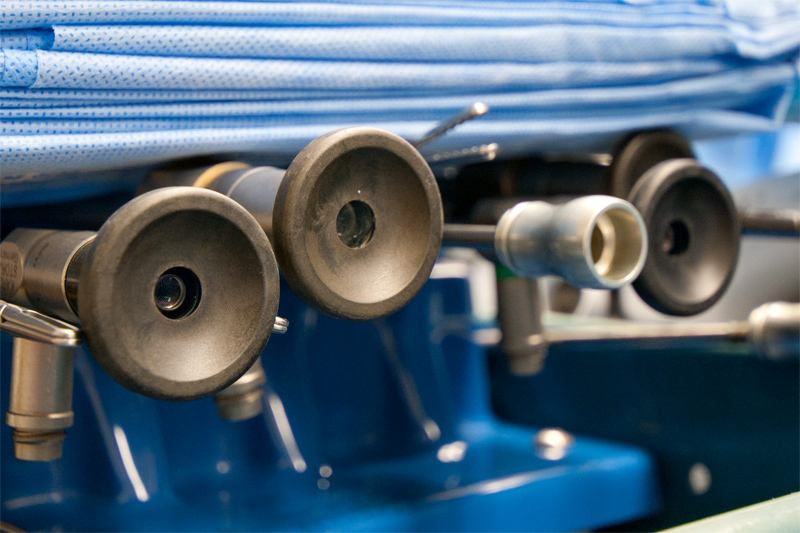 Various devices have been developed to counteract this problem, including lens flushing systems, mechanical wipers, continuously-flowing jets of air, and mechanically spooled reels of transparent tape. An alternative approach involves the use of a cleaning station anchored to the intra-abdominal wall during a procedure, upon which the surgeon can wipe the lens as required. Newer developments in laparoscopic technologies include virtual reality (VR) and augmented reality (AR) systems. VR systems rely solely on computer generated images, whilst in AR systems, images of the patient, captured using X-ray, volumetric CT or other types of medical imaging technique, are overlaid onto the live feed from stereoscopic surgical cameras to create an enhanced 3D image that the surgeon can refer to during a procedure without the need to look away from the operating site. 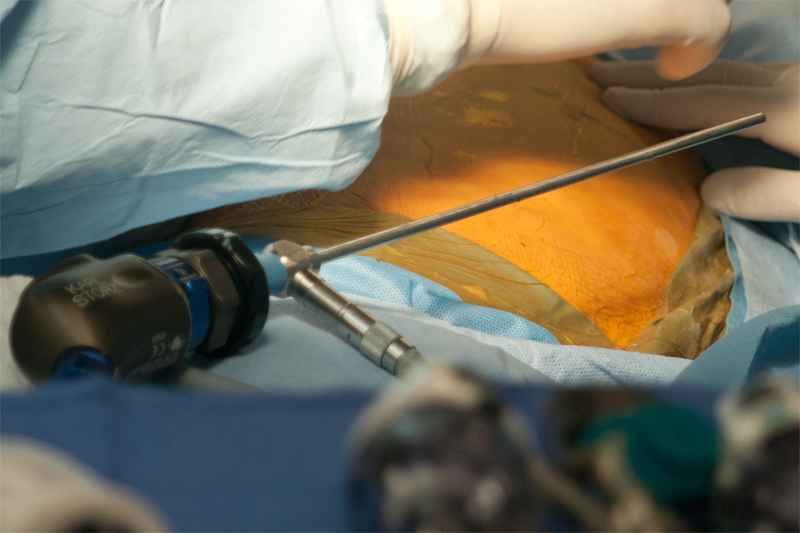 Although the technique has been used successfully in neurosurgery for a number of years, live AR laparoscopy is still in its infancy. However, both AR and VR systems have been used successfully in laparoscopic training applications. 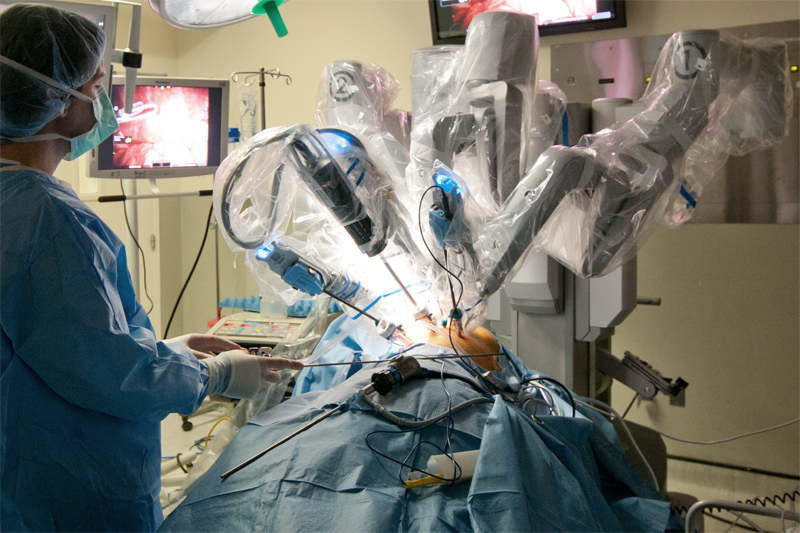 Advanced robotic cases may sometimes use a variety of different scopes and machine systems in order to facilitate visualization during portions of the operation. In some cases a laparoscope may be used at the same time as the robot to allow visualization from a different perspective so that structures can be identified with two viewpoints. A third scope, an endoscope, may be used to provide a perspective from inside the intestines or bronchi.